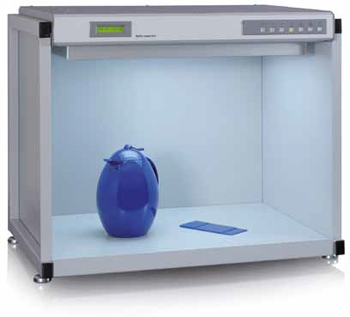 Qualitest offers extensive range of color, paint and coating testing equipment such as Light Booth which can help you take the guesswork out of color matching, saving you costly rejections, time, and customer confidence. Colors appear differently under different lighting conditions. Use of a light booth to simulate different lighting conditions helps to obtain objective color assessment, improves communication and reduces product rejections. We offer a complete line of light booths which allow you to see what your product will look like – independent of location and environmental influences. For critical color evaluation the byko-spectra light booth offers every option and feature that is needed to evaluate and communicate color with absolute confidence. No warm-up time or flickering which ensures quick and reliable color judgment. Comfortable testing in a compact design – for laboratory and Production. Color evaluation for daylight under 6 defined viewing angles: A tiltable sample table allows the samples to be presented at the following angles: -15°/15°/25°/45°/75°/110°. The illumination system also pivots, insuring excellent agreement with the measurement results of multi-angle color instruments. Sparkle evaluation under 15°, 45° and 75° direct illumination: Three individual LED sets simulate the impression of direct sunlight. The LED light sources are guaranteed for 10 years.